"I am Saint Germain. This has been a most delightful range of comments and questions and shared inspirations! And that is exactly what is needed - this Forum, this opportunity to observe the many different levels in which the energies of NESARA are combining with the energies of Love, upliftment and transmutation - to really bring this up into the forefront of people's considerations. I'm speaking of Conscious Considerations! There are so many contrasts or opposites in the World today, and there are so many voices speaking, that sometimes it is challenging, indeed, to know which one to listen to. "So I'm here, first of all, to say that the most important voice for each one of you to listen to is the voice of your own Hearts!!! And I'm speaking of your High Heart, your consciousness as it exists in the Higher levels, where only Love exists. High Heart is an extension - a connection, if you will - between what you know as your human Hearts and your fourth level Heart chakras, and so on - to connect you with the Truth of Who You Are, the Truth of All. And we have Truth Seekers here, and this is marvelous indeed! And we have Truth Tellers here. And we have Truth Tellers who have shared their Heart Inspirations, and this is a beautiful coming together in this way! "So, I am here to further discuss NESARA. But you all have that Truth already. It was - and is - Divinely inspired,and because of that, it is alive! It is not just words on a piece of paper, or several pieces of paper. It is alive because it carries with it Divine Love, Divine Lifestyle!!! And what is important, we have been hearing you say - and when I say 'we,' I am not here as one - I am here as one with the entire Company from the Realms of LoveLight, here to join with you. Please breathe in our energies and be One with Us in the Love We Are! "And it is from this Perspective that we look upon NESARA as a living opportunity, message, tool and, yes, law. But it is a Divine Law for you to utilize in moving up into the Higher levels, where you can live your lives not only in Freedom, not only in the knowledge of the Truth of what has been happening on Planet Earth - the history/herstory of the Planet - but the Truth of You!As I've already said, that Truth is Divine Love! And so, it is only appropriate that the means, or the tools, or the papers, if you will, would be having the purpose of uniting all of Humanity and extending out to all of the Kingdoms of Planet Earth in that High, Divine Truth of the Love You All Are!!! "And, yes, there is money involved because money has been an enslavement. Think about it. Those who have the most money in the World are the ones who are, for the most part, doing the darkest of deeds. And they are programmed to continue. That is why we have delay upon delay in getting the Announcement done. However, from our Perspective, it's all in the now moment, it's all done and it's all perfect. We invite you to share ourPerspective! This will ease your concerns or anxieties - if you have them - about when it's going to be announced, and this will put you in the flow of getting it officially done in 3D, just as it is already done in the Higher Dimensions! "It is for you, perhaps, to take a symbol and put it in your Hearts. 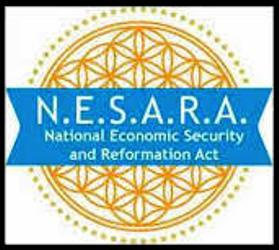 NESARA - put the word NESARA in your Hearts to symbolize all that it brings to summarize it, and then share that! The money will be there. It's already there. It's in my bank and I am in charge!!! "So it is not for you to enter into 3D programs of worry and anxiety. If you need some money, ask for it! Ask the Universe or your guides, or your Higher Dimensional Selves as managers or directors of your lifestyles, to supply you with whatever it is that you need. And sometimes needs are met even now - many needs are being met by means other than money, or dollars being paid for whatever it is that is needed. "And you have just heard another idea with this bank for services,* rather than having any money involved at all. That is NESARA in action! That is what each one of you are here to support if it inspires you so to do and then perhaps even to move beyond and be a participant, or as Ashtar says, an activist. "These are concepts, ideas, inspirations that I put to you - not as, 'You need to do more,' but simply, 'Would you like to do this on a multi-level plane, or become multi-dimensional in your approach to NESARA?' And most of you already are! You are gathering information. You are sharing information, and you are welcoming! You have already welcomed NESARA into your Hearts - all of the levels that your Hearts and you are occupying!!! "And so the update that I have for you is, yes! It is becoming more and more known, and its empowerment - the energy of NESARA, the very life of it - is becoming brighter and brighter all over Planet Earth, not just in the United States of America! But it shall be announced there because, just as I inspired the kingdom - or I shall say the 'republic' of the United States of America, and the concepts for that republic - it is that NESARA is what gives the United States of America the true Freedom of which it is so fond of speaking, but of which it is so often in denial!!! And this is where the clearing and the healing is initiated to go forth for all of the World - all of Planet Earth, below, on and above - coming together in the great, beautiful LoveLight that NESARA announces - by its own Announcement - activates and makes real in all dimensions occupied by Planet Earth! "And so, I call you 'Family.' We are Family of Ashtar On The Road, and this is my message to you, and my invitation to you to expand, and to expand NESARA within yourselves and beyond yourselves! And I have the Highest and most infinite of Love and thanks for all of you who are hearing all that has transpired and come forth! You may wish to listen to this again. ** Recognize how well all of the levels of existence, of lifestyles have been represented here today and love it all! Embrace it all! And be thankful for all of it for helping the World to move into that High space of Love, where only Love exists! "I offer the blessings from all here gathered, to all here gathered, because you, most Beloved Ones, Family members, are the blessings, the True Blessings to all of us who come to be with you from the Light!!! We join with your Lights and we honor you for serving as you do in your human bodies. So feel the Love. Feel the honoring. Let yourselves Light up even more! "And most of all, see yourselves as you are seen and known by all the LoveLight in the Universe. For that, Beloved Ones, is your Truth. That is Who You Are! And remember that, just as we are together in what you call this 'now moment,' we are always together. We are always One in the Light and there is only the High Dimensional Love, and all that Love creates, that is true!! !And that is the Truth we share. "Call upon I, Saint Germain, or anyone among your guides or among the Light Beings and allow us to be in Oneness with you in everything that you do, in all of your expressions, and in all of your creations and visions! Because we are here to move with you into the reality which is your Truth, the reality of Love, of the LoveLight You Are, We Are, in the Oneness of our Divine Selves. And so it is. Namaste!"